I remember one third grader who really struggled with sitting still. If I’d required him to sit while he worked, it would have been really hard for him to get anything done. This child needed to move to stay focused—for instance, he’d choose to work on his math journal while standing at his desk, rocking back and forth and kicking himself in the seat of the pants! In that position he was able to concentrate on his math work, and he was quite productive. 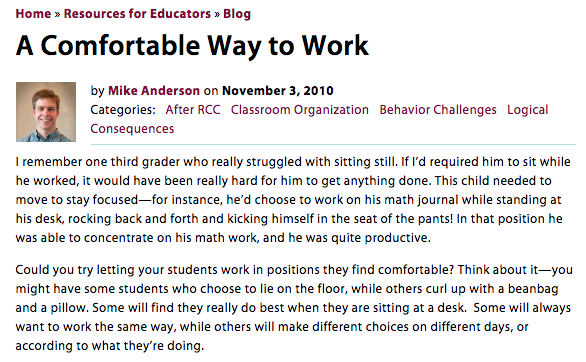 Could you try letting your students work in positions they find comfortable? Think about it—you might have some students who choose to lie on the floor, while others curl up with a beanbag and a pillow. Some will find they really do best when they are sitting at a desk. Some will always want to work the same way, while others will make different choices on different days, or according to what they’re doing. If you try this, keep in mind that it’s not as easy as saying, “Okay, everyone! 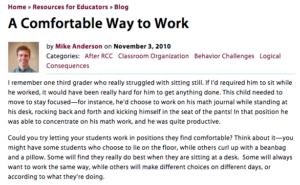 Find a comfortable place to work!” Children in your class may not know what they need, or how to make good choices, or how to meet their physical needs without distracting others. To learn those skills, they’ll need guidance from you and chances to practice and reflect. One way to start is with a class meeting focused on work spaces. Have students brainstorm possible places to work and consider the pros and cons of each. Then have them think about themselves as learners. “Do you think you work better alone or with others? Do you work better sitting in a chair, or in a different position?” Each student should finish the meeting with ideas they want to try for themselves. Next, let students try their ideas out, and afterwards, reflect: “Think about where you chose to sit today. Did it work for you? Turn and talk with a neighbor about how you think your choice worked. Decide if you will change anything about your choice next time.” This sort of reflection only takes a minute or two, and it’s time well-spent. Make it a part of your routine for wrapping up work periods, and you’ll send a powerful message to students: You are in charge of your learning! You can make choices that will help you learn! However, you do need to be ready to help students out when they make an unsuccessful choice. 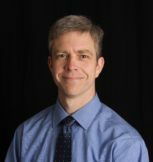 For example, if a student has chosen to lie on the floor to work, and he’s rolling around or looking at the ceiling, you need to stop the behavior and redirect him, for instance by saying: “Mike. Being on the floor isn’t helping you learn. Sit at a table to finish this work.” For that work period, Mike loses the privilege of choosing his work space, but he’ll have the chance to try again next time.